Induction motor converts an electrical power supplies to it into mechanical power. The various stages in this conversion is called power flow in an inductor motor. This is nothing but the stator input. The part of this power is utilised to supply the losses in the stator which are stator core as well as copper losses. The remaining power is delivered to the rotor magnetically through the air gap with the help of rotating magnetic field. This is called rotor input denoted as P2. The rotor is not able to convert its entire input to the mechanical as it has to supply rotor losses. The rotor losses are dominantly copper losses as rotor iron losses are very small and hence generally neglected. So rotor losses are rotor copper losses denoted as Pc. 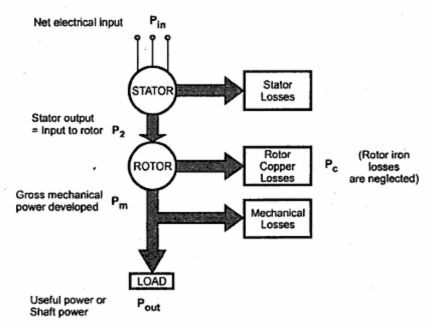 R2 = Rotor resistance per phase. After supplying these losses, the remaining part of P2 is converted into mechanical which is called gross mechanical power developed by the motor denoted as Pm. Now this power, motor tries to deliver to the load connected to the shaft. But during this mechanical transmission, part of Pm is utilised to provide mechanical losses like friction and windage. And finally the power is available to the load at the shaft. This is called net output of the motor denoted as Pout. This is also called shaft power. The rating of the motor is specified in terms of value of Pout when load condition is full load condition. The above stages can be shown diagrammatically called power flow diagram of an induction motor. This is shown in the Fig.1.